It’s been a while since I last posted a recipe, but I’ve been busy with this, that and the other and I haven’t done much baking or cooking lately; just quick meals. However, yesterday I had some time to try a new recipe, and thankfully it was a success. At first, I wasn’t sure what to call these: patties, mini burgers, meatballs; I was confused, but today I settled on meatballs, because that is what I had in mind when I was making them. 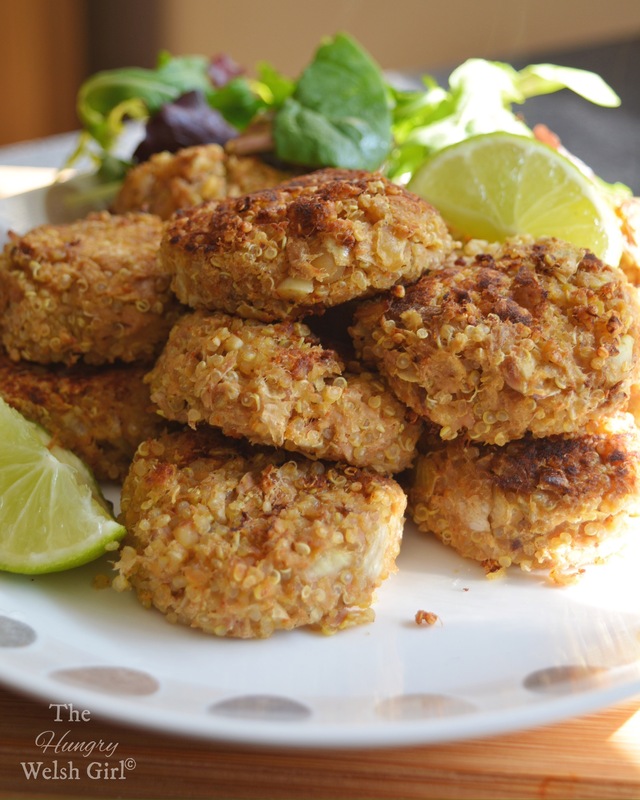 These tuna, chickpea and quinoa meatballs are so easy to make and depending if you own a food processor or chopper, they can be prepared and cooked even quicker than if you were manually chopping the ingredients yourself. Pre-heat your oven to 185c and cook your Quinoa. Now, peel and roughly chop your onion and garlic, then place it in the food processor, along with the chickpeas until everything is finely diced – not puréed. Empty the contents of the food processor into a bowl with the drained tuna, cooked quinoa and spicy Italian seasoning, add salt to the mixture and stir everything together until all the ingredients are well combined; now form into small, flat balls. After all your meatballs have been shaped, grease a baking tray with the butter and pop your tuna meatballs into the oven until they are golden brown – about 15 minutes. – You could eat these meatballs with spaghetti, vegetables or even in a power wrap with salad and tzatziki, like I did. For more recipes, reviews and ideas, follow me on Instagram – @Happy.Hungry.Healthy and tag me in any recipes you try.